Here are a couple of pics from Sunday’s Vikings/Eagles game, where Taylor sang the National Anthem. The first picture is just a sign, but it’s Taylor’s name up in lights, so I thought I’d throw it in. Ooooo….a side shot is better than no shot! And thanks Pete for getting the BOOTS! Wow, Knew you would find something, he looked wonderful. Wow, what an unexpected surprise — thank you! 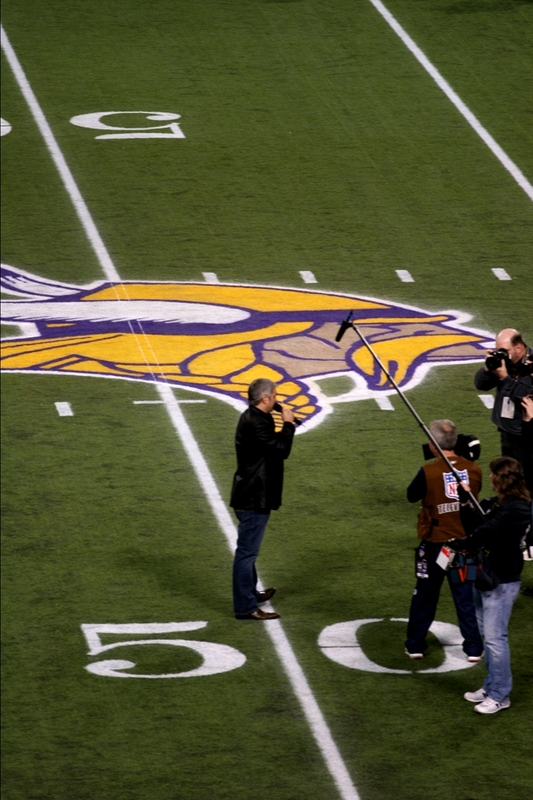 There he is right on the 50 yard line ready to go lol….looking great in those boots. Nice to see his name in lights, too. Nice! Thanks, TaysH! Can’t help but wonder where his toes end in those boots LOL! Well, dang! SOMEBODY recorded it. Thanks for the photos! Great to see Taylor up in lights! Hoping the video will surface on youtube soon. Video?? Looks like a camera to me. Let’s hear it for the boy, well not literally. All the exposure he’s getting will just continue. Lucky for all of us. Bloggerina does it again! This picture sure gives you an interesting view . . . look how close the cameras are. Oh my! You have a picture potpourri of goodness today Bloggerina! He’s looking really great! Ohhhhh.. a new pic. He looks mighty fine..even from the side! And yes, the boots are nice too. Thanks TH and thank you Pete! Fabulous full body pic! Are those pretty rare since we’re always focused on his amazing eyes and dimples? I read somewhere that one of the commentators had good things to say about Taylor. Wow! We hit paydirt today. Thanks. Love seeing Taylor’s name in lights where it should be!! Thanks for the pic, Pete, and to Bloggerina for posting it. Great pics. Enjoyed seeing them. Enjoyed the video also. Everything about him is do dog-gone sweet!